A short preview for one of the many fuselages that will be available in Starship Corporation. The Argosy Class was designed for the construction of small transport vessels, but can fulfill many other purposes. Looking good!!! How has the project been going lately? Hope you had enough time for yourself over the holidays. that ship look great even though it would be more of a "repair ship" than a "construction ship", it lack the place to store enough materials (or even a metal modeling room to build the parts needed) to build a space ship from raw metal or scraps but it got 2 cargo bay to store spare parts. With in-game ship in mind, he could repair a "bug" on it's lower deck(the room between upper and lower deck isnt enough to fit in the yanmori, i think.) while repairing bigger ship on it's upper deck or "under" it's lower deck. 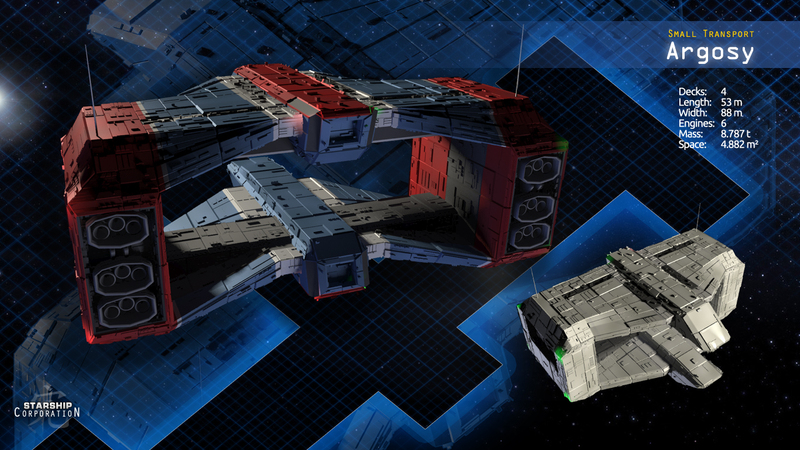 however, like you said, when not on a rescue mission, it can still be used as a simple cargo ship. NB what i think could be good addition to the game could be dedicated hull. like hull with special room already built inside (like reparation arm for a "rescue ship" or metal processing plant for a "mining ship") and you have to fit in remaining "standard" rooms to make the ship viable.